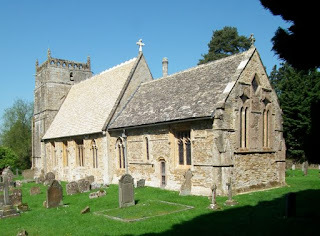 The parish church in the middle of Deddington, built of toffee-coloured stone like much of the town, is a mixture of periods, with notable details from the 13th, 14th, 15th, and 17th centuries. The 17th-century parts include the north porch, an example of the survival of a kind of Gothic into the period when much English architecture was turning Classical. The old antiquarians used to call this style ‘debased’, because it was a kind of mongrel mixture of traditional late-medieval Gothic with other elements that owed something to the new classicism – and the Gothic elements weren’t always very orthodox. The more current designation, ‘Gothic survival’, doesn’t do it justice either. Gothic has done more than survived: it has changed, sometimes in very interesting ways. My photograph, of the roof of the north porch, shows, I think, some of this interest. The basic form is a shallow dome, but if this sounds like a classical kind of roof, there’s nothing classical about the details. The dome is finished with a network of ribs a bit like those in a fan vault – but forming a circle, not a fan. It’s almost like a rose window, with the glazed parts filled in with stone and the central part finished with the ubiquitous quatrefoil. By adding a trefoil at each corner, the circle is squared. The whole design is a telling example of the coming together of tradition and innovation, and the sort of quiet architectural surprise which keeps me visiting parish churches. 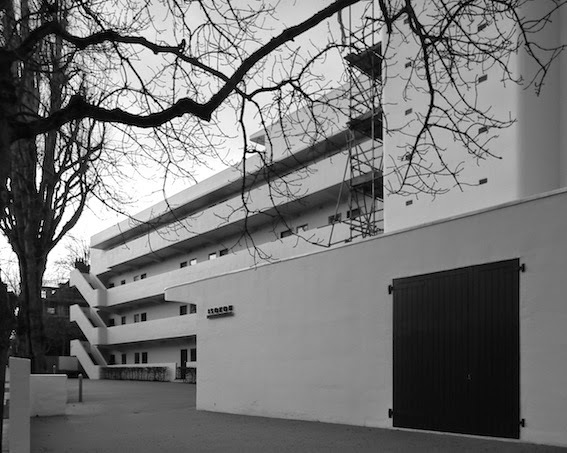 In 1934 the Lawn Road flats, designed by Wells Coates for the Isokon Company, were completed. They were the fruit of the joint vision of their architect and Jack Pritchard, who worked for the plywood manufacturer Venesta and had got to know Coates a few years before because they shared an interest in the use of plywood in furniture and building construction. The block was very different from anything else built at the time. Coates and Pritchard conceived it as accommodation for young single professionals – the kind of people who in the 1930s normally expected to rent a room in ‘digs’. Most of the flats in the block were therefore very small, consisting of a living room with bed space, a tiny kitchen, bathroom, and small dressing room where there were wardrobes and cupboards for clothes. Fitted furniture helped make these small spaces both agreeable and efficient. As well as these ‘minimal flats’ there were also some larger ones with room for two people. 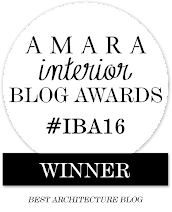 Just as remarkable as these interiors were the structure and exterior of the block. Made of reinforced concrete finished in white with the palest hint of pink, the block is quite unlike the neo-Georgian norm for flats at the time. The sculptural access balconies dominate the side of the block visible from Lawn Road, defining the building’s shape from curving corner at one end to protruding staircase tower at the other. As well as looking good, the balconies work structurally too – an underground tunnel under the front of the site restricted the footprint of the foundations, so cantilevering out the balconies made practical sense. Embodying a ‘modern’ way of life in an up-to-the-minute design, the Lawn Road flats gained a lot of publicity. Coates hoped that they would be copied, providing much needed compact accommodation in many other places. This seems not to have happened, perhaps because developers could make more money in other ways. And the Lawn Road flats themselves seem to have attracted more upmarket residents than the architect envisaged – Agatha Christie and Adrian Stokes had flats there, the block attracted architects and designers including, for a while, Walter Gropius and László Moholy-Nagy, and a surprising number of the residents were once involved in the world of espionage. * Nowadays, under the auspices of Notting Hill Home Ownership, the block has been restored and its flats are mostly home to key workers who are closer to the constituency that Coates originally imagined. *There’s more on this building and its inhabitants in David Burke, The Lawn Road Flats: Spies, Writers and Artists (Boydell Press, 2014). In the church porch at Ripple stands this curious shallow stone trough. When I first saw it I didn’t know quite what to make of it and at first took it as something displaced from a garden. Before I could wonder which plants might look good in it, though, I caught sight of a nearby label, which says that the trough is ‘traditionally’ said to have been used as a container for food for lepers or others with infectious diseases. The idea was that the trough would be placed by the roadside, away from houses, at a point where those with leprosy could come and collect food left by the charitable. Later, when it fell out of use, the trough was moved to the church for preservation. I don’t know how much store to set by this tradition. I’ve not come across anything quite like this before, though there’s a tendency to explain certain architectural features of churches (leper squints, leper windows, and so on) by linking them to the needs of those whose infectious condition prevented them from entering the church building. I’m not sure how much actual evidence there is for these connections. Meanwhile, the stone trough of Ripple is doing sterling service as an umbrella sand. Here’s to versatility. Prompted by my recent posts of an iron gents in Bath and a splendid pissoir in Bristol, a commenter mentioned the half-timbered public convenience at Clifton, and, as I was in the city briefly the other day, I took a walk across the greenery to find it. Here it is, huddled against the cliff by the Avon Gorge, a few yards from the suspension bridge that makes Clifton famous. ‘A bicycle shed is a building, Lincoln cathedral is a piece of architecture,’ wrote the great Dr Pevsner, defining the boundaries of his field. A public lavatory, by implication, might well fall into the mere ‘building’ category, but this one has enough marks of the designer’s effort to make it, surely, a piece of architecture. Read into this piece of architecture what you will: civic upmanship, a style verging on the rustic to fit into the green surroundings, a solid stone base to harmonize with the cliffs behind, a winning combination of grandeur and domesticity, a chance for the carpenter to show off with all those brackets and gables, generous eaves to shelter the passer-by during rain. However you look at it, the city that could produce both the suspension bridge just along the road and the grand Regency terraces of Clifton a few hundred yards away clearly thought it could do something memorable when putting up a building with an altogether humbler, though no less useful, function. The denizens of Clifton should be flushed with pride. In Wells, turning my back, for a moment, on the magnificent west front of the Cathedral, and remembering Jonathan Meades’s characterization of another cathedral close (the one at Salisbury) as a complete three-dimensional history of architecture, I focused on the more modest houses on Wells’s Cathedral Green. My eyes came to rest on this, one of a varied row on the Green’s south side. The first thing to catch my attention was the doorway, with its beautiful late-18th century fanlight and door surround with open pediment and Doric uprights. The fanlight, it is said, was brought from Dublin and the surround was put together from various fragments, including some bits that began life in a convent. All this high-class bricolage points to the fact that, for all its sash windows and fancy entrance, this is actually a 17th-century house that was altered in the 18th and 20th centuries. The proportions – with low ground floor and the whole building sitting lower down the the green in front of it – are another hint to the building’s age: not for this house the standard narrow sash windows, three panes wide and four deep, that are usual in the Georgian houses of cities such as Bath. Here we have glorious big windows with 20 panes each on the ground floor and 16 panes on the floor above. Their size is no doubt testimony to earlier 17th-century openings – and to the fact that this is a north-facing house with an interior that needs plenty of light. Perhaps these generous windows help to make the house as pleasant inside as, set off with the elegant railings, gate, and iron overthrow, it is from without. A brief addendum to an earlier post. Regular readers might be interested to know that the artist known as Banksy has confirmed that he did indeed paint the graffito in Cheltenham, about which I blogged in a post during April when the attribution was still unconfirmed. 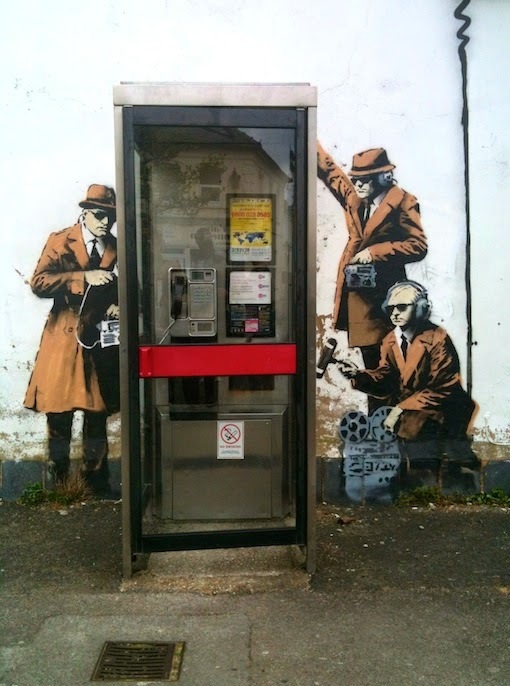 This piece of wall art, on either side of a telephone box in Cheltenham's Fairview Road, alludes to the town's role as the home of GCHQ, the British government's 'listening post'. It has created a stir locally, and more widely, and it provoked both specific comments and personal memories in my earlier post. Bansky's confirmation of the attribution is noted in a question-and-answer session on his own website and in the local media. A friend remarked that the painted boss in my previous post would look at home on the prow of a sailing ship, and I have to say he’s on to something. The straightforward, slightly naïve carving of the boss is close to folk art, as is quite a lot of the sculpture on churches, especially the gargoyles, corbels, grotesques, and similar carvings on some of our smaller parish churches. Folk art is usually defined as art created by untrained amateur artists who worked outside the tradition of art education, apprenticeship, or art school. Medieval church carvers no doubt served apprenticeships and carved for a living but their style often seems more personal and provincial than the work of the sculptors who decorated the west fronts of the great cathedrals, from Chartres to Wells. Call it rustic, call it folk art, it does have something in common with the carving of old shop signs, puppets, and ship’s figureheads. I therefore turned to the pages of the several books on English popular art and found, in Noel Carrington and Clarke Hutton’s Popular English Art (King Penguin, 1945), this colourful illustration by Hutton of the figurehead from H M S London. Noel Carrington described the art of ship decoration like this: ‘Marine decorators took their motives from those current in architecture and furnishing ashore, but gave rein to that little extra exuberance for which sailors always seem to have a partiality.’ In Britain’s navy, such figureheads, along with a riot of other carving along the bows and sterns of ships, found favour between the Restoration and the end of the 19th century Subjects varied from goddess to royalty, lions to naval heroes. The early-19th century figurehead in Hutton’s picture is in the National Maritime Museum at Greenwich. Hutton seems to have gone for exaggeratedly strong colours – the actual figurehead has much paler skin and her dress has a more muted hue. Her crown, in the form of a castle or city wall, is a common attribute when the ship’s name is that of a city – the notes on the museum’s website suggest that it may be based on the White Tower, the central structure of the Tower of London and the square structure with corner turrets is certainly reminiscent of this famous castle. Readers within reach of London who like this kind of thing will find much of similar sort in Tate Britain’s Folk Art exhibition, which opens on 9 June and promises to be spectacular. I’m planning my visit. The entrance to Malmesbury Abbey contains some of the most celebrated Romanesque sculpture in England but, in this blog’s spirit of searching out the unregarded, I’m featuring today not the great carvings in the porch, but one of the bosses from the ceiling in the church itself. I’m not claiming greatness for this carving, just suggesting that bosses can give pleasure if we take the time look at them – armed perhaps with what their medieval creators could not have imagined, a pair of binoculars or a camera with a telephoto lens. This boss, then, is not a great piece of carving, but has some nice touches, such as the swirling hair and flanking leaves, to compensate for the rather small mouth and lack of modelling around the chin. I don’t know who it portrays – some say that it represents Margaret of France, second wife of Edward I. Margaret died in 1307 and the vault is early-14th century, so that’s a possibility. She was not formally crowned, so the carving’s lack of a crown doesn’t mean it cannot portray her. The other interesting feature of the boss is the colour. I believe this was added during a restoration in the 1920s, but the yellow and terracotta shades and the gilding are probably not too far from the medieval colouring. However the overall effect is more modern somehow. Is it the blushing cheeks? Or the use of flesh tones that make it look as if the subject has naked shoulders? Whatever the case, the carving is now an interesting hybrid, part of the evolving and transforming history of the building that contains it. Items in the news recently have spread the word the the British Council have been putting a series of fascinating early documentary films about Britain on its website. When I began to browse these films, my attention was immediately caught by Architects of England, a 12-minute film directed by John Eldridge and produced by Strand Films. 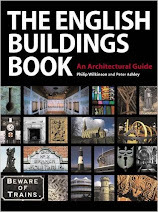 It traces the story of English architecture from Stonehenge to the 1930s. The buildings are beautifully photographed in black and white, there's a narration delivered by celebrated newsreader Alvar Liddell, and music was provided by the prolific composer of symphonic and film music, William Alwyn. This 1941 film, then, is very much of its time, but still worth watching. Many of the buildings shown are well known and some of the most famous examples of different periods, from Durham Cathedral to the Houses of Parliament, are included. However, there are also some interesting less well known examples, but with one or two exceptions the script does not mention the location of the buildings shown in the film. I have therefore set about identifying them. The British Council site includes some identifications, but what follows is a longer (though still not complete) list, with timings. 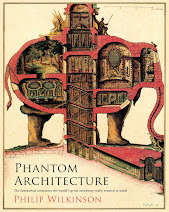 I hope you enjoy the film – I'd be happy to hear from architecture enthusiasts, via the Comments section, with any details of the structures that have eluded me.